Former Pittsburgh Steelers running back Le'Veon Bell. Le'Veon Bell sat out a full season while considering where he'd make his next playmaking moves. Well-rested, motivated and armed with a new contract, the star running back is joining Sam Darnold and the New York Jets. Bell agreed to a deal early Wednesday morning, a person with direct knowledge of the negotiations told The Associated Press. The decision ended months of speculation about where he'd resume his playing career after six years with the Pittsburgh Steelers. The person spoke to the AP on condition of anonymity because teams can't officially announce signings until the start of the new league year Wednesday afternoon. ESPN first reported the signing, and said the deal is for four years and $52.5 million - including $35 million guaranteed. Bell, a former Michigan State star, also announced his decision on Twitter , saying: "I'm back in the green baby, let's get it." Several teams were mentioned throughout the past few days as having interest in signing Bell, with the Jets consistently among them. Many football fans and reporters took to their computers to download the new album released at midnight by the running back - who goes by the stage name "Juice" - to glean any potential clues in his lyrics he might have included about his next football destination. The news, however, came as many were in between tracks. And, Bell was immediately a big-time hit among the Jets and their fans. "Welcome my brutha @LeVeonBell," linebacker Avery Williamson tweeted. "I'm in Miami brotha," safety Jamal Adams tweeted at Bell. "We going up tonight!!!" @LeVeonBell I’m in Miami brotha. We going up tonight!!! The deal gives Darnold and new coach Adam Gase a big-time playmaker, arguably the best player at his position before Bell opted to sit out all of last season rather than sign a franchise tender with Pittsburgh. The 27-year-old Bell is a two-time AP All-Pro selection and three-time Pro Bowl pick who immediately upgrades the Jets' backfield. New York still has Isaiah Crowell, Elijah McGuire and Trenton Cannon, but Crowell is likely to be released after one season with the team. Bilal Powell, the team's fourth-round pick in 2011, is a free agent and unlikely to be back. 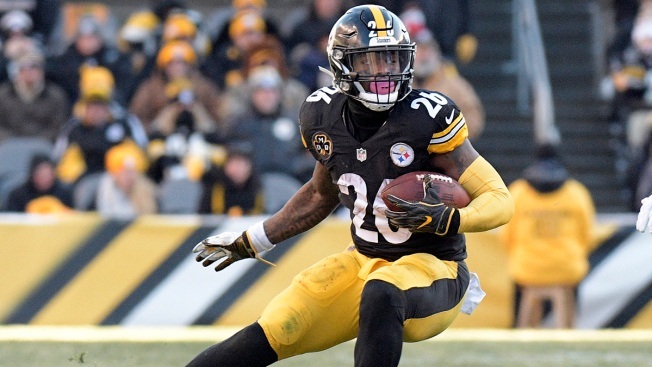 Bell has rushed for 5,336 yards and 35 touchdowns, and has 312 catches for 2,660 yards and seven scores as one of the most versatile and dangerous offensive players in the NFL. His 128.9 yards from scrimmage per game over his career is the best mark in the NFL since the 1970 merger. Bell's career reached a crossroads, however, last year when he declined to sign his one-year, $14.4 million franchise tender with the Steelers and made himself ineligible to play. It was an unprecedented move as Bell - who received the franchise tag in two straight years - skipped a season in his prime to preserve his long-term health and secure a big payday. Last month, Pittsburgh decided to not place the transition tag on Bell. That cleared the running back to become an unrestricted free agent when the NFL's new year begins Wednesday. And the Jets pounced on a player they think can help Darnold take their offense to another level - despite the fact Bell hasn't played since Pittsburgh's playoff loss to Jacksonville on Jan. 14, 2018. That means it will be a span of 19 months in between game appearances by the time the preseason begins in August. The Steelers drafted Bell with the 48th overall pick in 2013. He combined with quarterback Ben Roethlisberger and wide receiver Antonio Brown to form Pittsburgh's "Killer B's" on offense, a potent trio of game-breaking talents. With his patient running style and explosive burst, Bell quickly established himself as one of the best backs in the league. He was also a top pass-catcher out of the backfield, finishing 10th in the league with 85 catches in 2017. That combination of production had Bell focused on a contract that rewarded him like the dual threat he is. He and the Steelers failed to reach an agreement on a new deal last summer, and he skipped training camp for the second straight year. This time, though, he never returned to the team. Instead, he'll join the Jets and look to re-establish himself as arguably the best overall running back in the game - and try to help a franchise that hasn't been to the playoffs since the 2010 season get back to winning. The move to get Bell was the latest in a busy two days for general manager Mike Maccagnan and the Jets, who also have agreed to deals with linebacker C.J. Mosley, wide receivers Jamison Crowder and Josh Bellamy, and are re-signing defensive end Henry Anderson and backup cornerback Darryl Roberts. New York also acquired left guard Kelechi Osemele from Oakland over the weekend.